Around 2-5% of patients presenting to the Emergency Department will be there because of a headache. (1) Most of these are benign, but it’s not uncommon to be faced with a patient with the worst headache of their life. Until now, it has been recommended that all patients with a clinical suspicion of sub-arachnoid haemorrhage and a negative CT head be referred for a lumbar puncture at 12 hours after the onset of headache. (2) Is it time for a change? Can we send some of these patients home? Can we avoid referring them for what can be an unpleasant procedure? 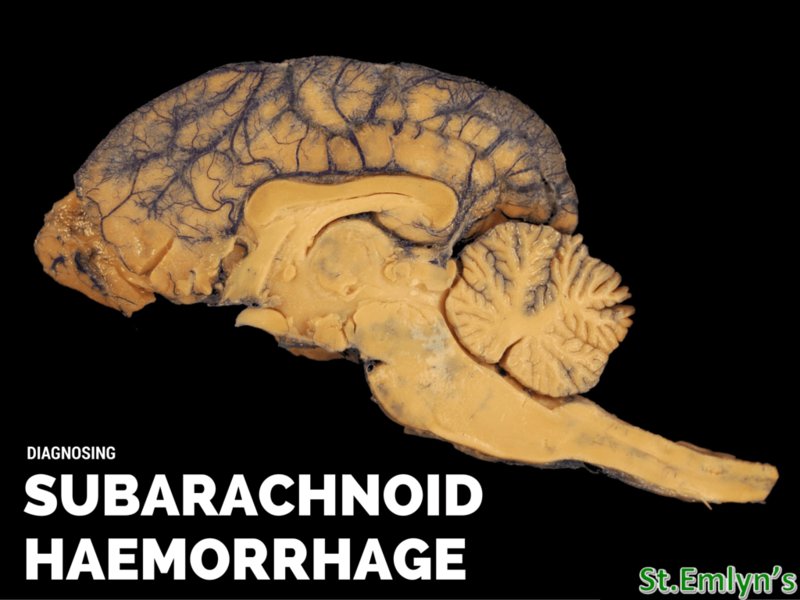 Let’s talk about subarachnoid haemorrhage (SAH). What is it? Is it bad? The typical headache is described as a sudden onset headache, like a blow to the back of the head, or a “thunderclap” headache, and whilst this should certainly ring alarm bells for SAH, patients can present differently. Most neurologists agree though, that in the context of a headache, to include SAH as a differential, its onset to peak must be within minutes, and it must last for longer than one hour. (1) Symptoms can last for weeks, and whilst adverse features such as nausea, vomiting, neurology, seizures, neck pain and stiffness, confusion, and decreased conscious level are uncommon, the absence of these does not immediately rule out SAH. Okay, so we know it’s bad. What can we do to minimise our chances of missing one of these? In November 2015, a Best BET(5) was published in the Emergency Medicine Journal, which looked at whether a scan within 6 hours of headache is sensitive enough to rule out subarachnoid without need for further investigation. A previous BET(6) had looked at CT in general to rule out SAH, however since then 4 studies have looked at early scanning with good results. The conclusion of the BET is that a scan within 6 hours is sensitive enough to rule out SAH in patients presenting without adverse features, on a third generation scanner with thin slices, if reported by an experienced radiologist. Just before publication of the BET, a further study by Sayer et al. (6) was published, which looked at 2,248 patients who underwent lumbar puncture after a negative CT head. They found 92 positive and 299 inconclusive results but only 9 vascular abnormalities. This means an NNT (number needed to tap) of 250 and a lot of false negative lumbar punctures. Relating to our initial 6 hour CT, only 1 of these false negative scans occured within 6 hours. Whilst this was not the focus of the paper, it reinforces the idea of early CT to rule out SAH. The Sayer paper has been reviewed well across the blogosphere, and you can read a great appraisal at SGEM, where Kirsty Challen also produced this brilliant #paperinapic to illustrate the results in an easy to understand format. So, your patient presented with a headache, it came on over a few minutes and has lasted longer than an hour but less than six. They have no adverse features, but you are worried about SAH, and you want a CT scan that will help you to make a decision. How are you going to go about this? Firstly, find out what generation scanner you have. Our 2 scanners here in Virchester are both 3rd generation, and from talking to our friendly radiographers it is likely that if you’re in the UK, your scanners are too. Indeed, all 16+ slice scanners recommended by the Department of Health Centre for Evidence-based Purchasing are 3rd generation. (7) Therefore, this shouldn’t be a stumbling block, but do check. Next, talk to your radiologists. In order to give patients the correct information to make a decision on management, the scan must be thin slice, and must be reported by a radiologist experienced in reporting CT heads. This means that the radiologist must prescribe a thin slice protocol for the scan, and ensure someone experienced reports it, with specific focus on looking for a subarachnoid haemorrhage. You must make sure you include this information on the request form and when you speak to them. Okay, your scan comes back clear, no impression of subarachnoid haemorrhage. Now to talk to the patient about what you have found. At this point you should have already mentioned that you are looking to exclude SAH, as they need to know what the CT scan is for. Having undertaken a history, examination, and a CT head, the patient should know that you’re worried about a subarachnoid haemorrhage. They will likely be relieved by the scan being normal, and based on your clinical judgement, and results of the assessment, maybe you will be too. No investigation is 100% accurate. Based on the assessment done it is very likely this is a benign problem but there is a small risk that this is something serious, and things could get worse. The next investigation we could do is a lumbar puncture, though they would need to be admitted to hospital, and there are risks to doing this procedure as well. However, research suggests that for patients like them, we would need perform a lumbar puncture on 250 patients to get one positive result, and some others of these 250 patients would get a false positive, leading to further tests which may be unnecessary and carry further risks. The patient could return at any time if they were concerned or their symptoms changed. This may enable a joint decision to be made for conservative management at home. This is a potential concept to reduce the number of invasive procedures based on the current evidence which shows that a large number of these may be unnecessary, and could possibly lead to further harm both from these procedures and further investigations undertaken in the case of false positive results. Further research is looking into decision tools which could be used to stratify patients into low- and high-risk groups and may help us to do this even better. In patients presenting with lone headache, with clinical suspicion of subarachnoid haemorrhage but no adverse features, a CT head is sufficient to rule this out, if performed within 6 hours of onset on a thin-slice, 3rd generation CT and reported by an experienced radiologist. For patients who do not meet the above criteria, or those presenting after 6 hours, an urgent CT head should be requested, and if negative, current evidence suggests these patients could also be discharged. If there is a high clinical concern for subarachnoid haemorrhage despite negative imaging (for example in patients with previous SAH), the patient should be referred for further investigation. Patients who are discharged should be given advice to return if they develop adverse features such as neurology or decreased conscious level, or are concerned about new or evolving symptoms. Of course, if they have a positive scan, urgent neurosurgical opinion should be sought and local guidelines followed regarding management. Goldstein JN, Camargo CA, Pelletier AJ , et al. Headache in United States Emergency Departments, work up and frequency of pathological diagnoses. Cephalagia 2006;26:684–690. Hi Chris. I really enjoyed reading your post. I don’t really agree with the conclusions from this paper & wouldn’t advocate doing this in my ED. The main problem was the work-up bias endemic in this study as only about 40% of patients who had a -ve CT got an LP. Therefore, you’re not doing the gold standard test in over half the patients and relying on the out-patient follow up which missed quite a lot of patients. 20% were lost to follow up. Therefore, to me, it’s not a fair comparison. I’d also be concerned about the radiologist’s reporting the CT may be experienced. In our department, the night time reporting is out-sourced to the other side of the world which is subject to quite a variable standard of reporting. This is why this worries me a lot & why I wouldn’t adopt this approach at this time, based on this evidence. Thank you for your comments, it’s definitely a controversial and popular topic at the moment! Regarding the Perry paper, which is the one you’re talking about, of the 20% who didn’t participate in telephone follow up at 6 months, only 3% were lost to all follow up. The rest they chased up with regional units and the coroner, which whilst not absolutely reliable, showed these patients were alive at 6 months, or died (8-10 patients only) of a non-neurosurgical cause. This would imply that, even though they’d had no LP, this didn’t lead to mortality from subarachnoid haemorrhage. The other papers I’ve referenced also contribute to the evidence for ruling out SAH with early CT, and the more recent Sayer paper concludes that even with a reported normal CT, we’d still have to do a lot of lumbar punctures to identify those missed. All of the patients in the Sayer paper had CT and LP. It’s a serious condition and one not to miss, so as I mentioned in the post, it’s important to make sure you’re confident with the reporting of your scans. If they’re not being seen by experienced radiologists, you can’t really use them to influence decision-making, as the research performed relies on this. It may be more possible during the day time where the scan can be seen by an on-site consultant, but overnight is tricky for most departments and may require the patient to stay in until the scan can be reviewed by one. I’m sure there’ll be more research on this topic, and hopefully a validated clinical decision tool can help us to be more confident. Please can you clarify this paragraph: “For patients who do not meet the above criteria, or those presenting after 6 hours, an urgent CT head should be requested, and if negative, current evidence suggests these patients could also be discharged”. If the CT is performed more than 6 hours after onset surely we cannot rule out SAH?! Sorry for that. Whilst a CT within 6 hours could be used to rule out SAH, the Sayer paper looked at all patients who had a CT and LP for ?SAH, regardless of time from onset. Whilst we cannot just use CT to rule out SAH in this population, with the evidence from the Sayer paper suggesting a need for 250 lumbar punctures to find one significant haemorrhage, it may be that a discharge with advice is more beneficial for the patient. I hope that is clearer! … non aneurismal SAH (15% of SAHs ? ) aren’t dangerous if you survive the and the patient you’re about to DC is unlikely to have a big one if any. So let’s assume we’re left with aneurismal SAH as the sole concern, that we have no reason to suspect other causes of thunderclap headache that an LP might prove or suggest. No SAH on CT. Why not rule out the possible cause that is dangerous since it may recur and kill or maim all of a sudden: the aneurism ? CT angio or MR angio are unlikely to miss it, but I’d be curious about the % that may be missed including because of vasospasm with angio CT scan. Imaging aiming at diagnosing aneurisms are still being frowned upon since we could overdiagnose innocent incidental aneurisms which we are told occur in (out of aging memory) 2% of the population. I’m concerned with overdiagnosis too, which may lead to further invasive and dangerous testing for incidentalomas. PLus causing inability to raise a loan or get insured. – that an aneurysm found in the context of a thunderclap headache or any other suspicion of SHA is as innocent as one found incidentally when performing imaging for reasons other than SAH suspicion. Bayesian reasoning suggests otherwise. There is the aneurysm size that matters, too. – that the 2% prevalence of aneurisms in the healthy population is true. I’ve asked many a neuroradiologist who sees > hundreds of head imagings a year. They don’t see those 2% aneurisms. So I have some doubts angio imaging is as deleterious as we’re told. What is more dangerous ? Angio-imaging ? 249 LPs ? When I wrote about discharging a patient with advice, I meant giving them advice regarding returning to the hospital if they had worsening or new concerning symptoms, as I had stated earlier in the article. I didn’t mean asking a neurosurgeon for advice before discharging the patient. Regarding the use of CT angiography, as you’ve already stated it can pick up incidental aneurysms, and also can miss aneurysms if they are in areas obscured by bone or artefact. In the Sayer study, of the 741 patients who had CT angiography because of positive/inconclusive/uninterpretable LP results, they found 10 aneurysms, or 1.3%. They didn’t scan everyone in the study though so we don’t know about those who were LP negative. Regarding your last two points, the literature suggests, as you say, 2% incidence of aneurysms in the general population with a range which varies depending which paper you read, but is generally between around 0.5 and 7%. There’s been little research since the Rinkel paper in CT angiography in this population vs LP, but in this systematic review, they found a risk of rupture per year of 0.7%, but a relative risk of rupture of 8.3 in those aneurysms that are symptomatic, and 5.5 in those larger than 10mm. It’s not clear at the moment if CT angiography would be beneficial, purely from a lack of evidence, though with their findings on lumbar punctures, Sayer’s team refer to the possibility of using it in the future. I hope at least my initial sentence clarifies what I wrote regarding patient advice, and hopefully the rest helped with some of your other comments. Unless I am just being dense, this sentence appears to contradict itself. If those symptoms are uncommon, I would not be using their absence as a factor to rule out SAH. The paper referenced in that paragraph states that those symptoms are supportive of a diagnosis of SAH, that an absence should not rule out SAH, and that a proportion will present with only headache. No, you’re correct, just a few negatives. Adverse features aren’t common, but it doesn’t mean you can rule out subarachnoid if they aren’t there. Or, rewording the original sentence – the absence of adverse features does not rule out SAH. Good article; agree with your conclusion! In Leicester, we have already implemented a clinical decision rule that allows us to avoid LP in many patients. Take a look at http://bit.ly/1KRsGPK for details of how we derived and ‘retrospectively validated’ our rule. Saw this at RCEM, loved it. Thanks for the link so I can peruse it again at leisure! Thank you for reading!